A memorial service will be held at noon Friday, Jan. 4, 2019 at Bethlehem Lutheran Church in St. Cloud for Kenneth H. “Ken” Twit, age 64, of St. Joseph. Ken died Dec. 30 at the St. Cloud Hospital with family at his side. The Rev. Dee Pederson will officiate. Visitation will begin after 10 a.m. Friday at the church. 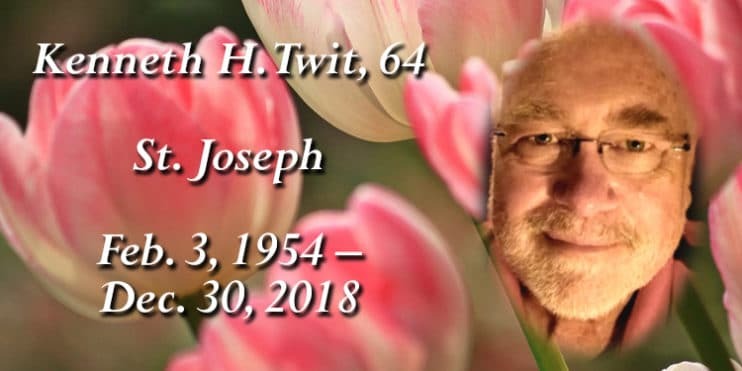 Twit will be remembered for his generosity, wit and love. He dedicated his time to numerous organizations including St. Joseph Fire and Rescue, St. Joseph City Council, Community Theatre, RSVP and Crew 52 to name a few. He shared his knowledge and skills, and taught in a meticulous way. He showed his love by sharing his time and passions with others. Ken was born Feb. 3, 1954 in St. Cloud, Minn. to Jerome and Lillian (Theisen) Twit. He fulfilled his desire for helping others through his practice of pharmacy. He began his career as a pharmacist in St. Joseph and ended at the VA Medical Center in St. Cloud. On June 12, 1998 he married Audrey Staller (Foss). Together they enjoyed many travels, projects and their love of being together. Survivors include his wife Audrey; his children from his first marriage: Katie (Bill) Larkin, Kelly (Steve) Ring, his children through Audrey: Tom (John) Staller, and Brock (Laura) Staller, five grandchildren: Keaton, Noah, Leela, Olivia and Harper, and sisters: Sandy Haggerty, Jeanne Bonfig and Kathy Twit.